Renew-all are surface refinishing specialists covering the Central belt of Scotland. If you are looking to renew your bath to its former glory then renew-all are the refinishing specialists. Wither it is cast iron, porcelain or fibreglass bath, Renew-all will refinish and bring back the shine. If you are tired of the existing colour of your bath or it is out of fashion, renew-all can completely change the colour of your entire suite, no plumbing, no tiling, no mess – all work carried out in a few hours. Renew-all can change the colour of your bath suite can repair chips or major damage to your shower tray refinish all ceramic tiles , repair cracks, seal in grout leaving you with a bacteria free surface. Kitchen worktops get damaged and worn very quickly. Avoid the huge cost of replacement by refinishing with renew-alls impact resistant durable coatings. 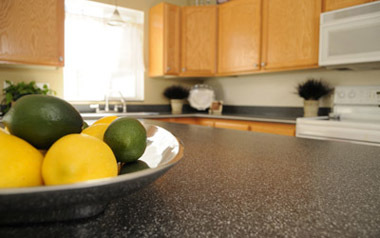 Refinishing your kitchen surfaces brings your kitchen out looking like new.